Mindful Echo is reading her labels. I'm sure most of us are in the practice of reading labels when we're buying our groceries. For me, at least, it's been common practice to check the ingredients, the grams of sugar, sodium, and so on. It comes naturally when I shop because I have food allergies and I want to be conscious about what I'm putting in my body. The strange thing is, I'm not generally as cautious when it comes to what I'm putting ON my body. It makes no sense because I do have sensitive skin and I want to limit unnecessary exposure to chemicals. Sure, I check to make sure things are "natural" or "organic" or "plant derived" but I rarely flip a package over. Why? Because I cannot make any sense of the label. Unlike with food, where I can recognize different names for sugar (glucose, fructose, sucrose) and gluten (maltodextrin, modified food starch), with body and cosmetic products, I can't identify a single word. So, how can I tell if it's what I want to be buying? Let's take this Nature's Gate Hemp Shampoo as an example. What I do appreciate about this label is that it provides clarification for most of the ingredients in brackets to provide some recognizable language to the consumer, like Vitamin C, Milk Thistle, Plant Derived, etc. Still, I question whether all this stuff is actually something I need or want to be using. To be clear, I don't believe that synthetic automatically equals bad. What I do wonder about, though, is if all this processing is actually creating the best product for my body. Ideally, I'd be using hand made products for everything: pretty bars of soap with minimal ingredients and sweet little jars of scrubs and creams made from everyday sources. In the meantime though, it'd be nice to be able to read a bottle of shampoo without an advanced degree in biochemistry. What are your thoughts? Does it matter what's in the cocktail as long as all the ingredients are "natural?" Queen Composter is learning from life's little curve balls. I love gardening for so many reasons, not least of which because of everything gardening has taught me. Anyone who has tried to grow something can tell you something that they have learned through the process. Some speak of the appreciation they have for nature, for being witness to the life around them. Others speak about the time spent outdoors and the meditative effect of daily tasks and chores. Then there is the satisfaction of growing one's own food and being intimately connected to the earth. My favourite gardening lesson is also my favourite life lesson. There are no mistakes in gardening, only learning experiences. It is all a matter of perspective, really, as is most of life. Glass half empty or glass half full? Sure there are posts and books about common newbie gardener mistakes, like not giving plants enough space, under or over fertilizing, or planting in the wrong location. 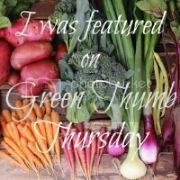 I have read many of them, and when I started container gardening many years ago, and then gardening in my raised beds 5 years ago I did what I do when I start anything new: I read up on how to do it. But gardening, like life, cannot always be anticipated perfectly, and sometimes things do not go as planned. Of course it feels like a mistake when the garden does not turn out the way you intended it. But there are no mistakes, only learning experiences. An example is my backyard garden so far this season. I was very excited to plant asparagus for the first time this year because I love perennial plants that are plant once and go. I wouldn't be able to harvest any spears this year to allow the plants to establish themselves firmly in the soil, but oh the wait would be worth it for delicious, fresh homegrown spring asparagus. I read the information packet that came with the roots I ordered from a local seed company, did a quick search on the internet to read a little more and then I planted them quickly before heading off on a family vacation. rather than the future spears. Basically this is upside down. While away, I woke up one night in a sweat because it suddenly dawned on my that I had planted the roots upside down. A typical newbie mistake! After cursing my mistake and being upset that I would now have to wait two years for my own spears, I calmed down and vowed I would measure twice, cut once from now on, so to speak. My asparagus bed with nothing. 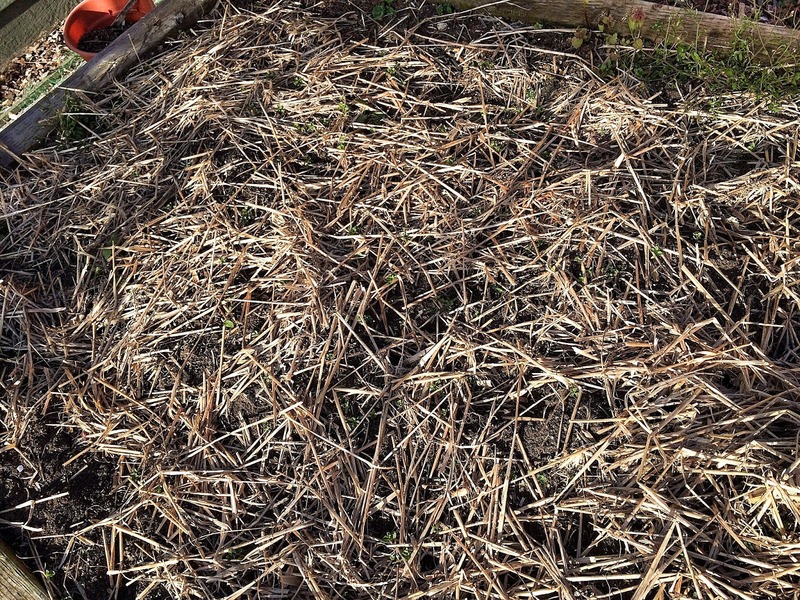 When it came time to plant my potatoes, after properly chitting them (another lesson learned), I decided to fill the raised bed where I had planted the asparagus (in half of the bed). 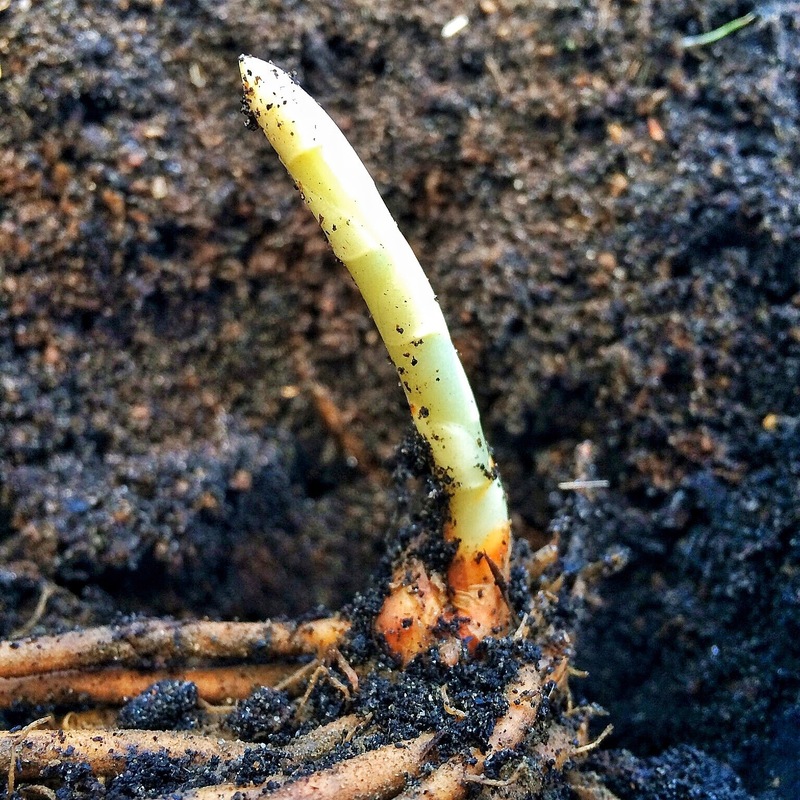 As I finished the planting I came upon two asparagus plants that had not rotted. Instead of leaving them, I decided to pull them up and have a peek. Lo and behold, a spear! I am crossing my fingers that these little plants survive so it isn't a complete bust (and it very well might be because I think I've still planted them incorrectly), but if it is I have learned what asparagus roots look like, what it looks like as it is growing, and that I should always ask questions at the gardening shop about how to plant when trying something new. Hooray, a little spear! Isn't it so cute (it's about an inch long). Last year I tried growing potatoes in three grow bags to free up space in my limited raised beds. They appeared to do well, but I found they dried out too quickly, and I was disappointed in the yield compared to the three plants I had in my beds the year prior. This past weekend I decided to pull out the grow bags out of the back of the junk area of my yard to dump the remaining soil into my garden. Surprise! There are now three grow bags with potatoes growing in them. It's a good thing we love potatoes in my family, because hopefully we will have enough to last until the fall, and maybe some early season ones now as well. With each mistake, and each season, I am slowly learning which plants are hardy and can take abuse, and how much abuse (newbie gardener mistakes) each plant can take. The very neglected potatoes in the grow bags. So, there are no mistakes in gardening and in life, just learning experiences and happy surprises. For Yulemas this year my lovely hubby built raised planter beds (using only a handsaw and drill, he got a skilsaw for yulemas itself.... which he said would have been helpful BEFORE while building my presents!) and heirloom seed varietals. I was (am) excited: it will be our first vegetable garden! Now is the time that we should be thinking about starting our seeds inside, at least some of them, so that as soon as the frost is gone we can start a-planting. 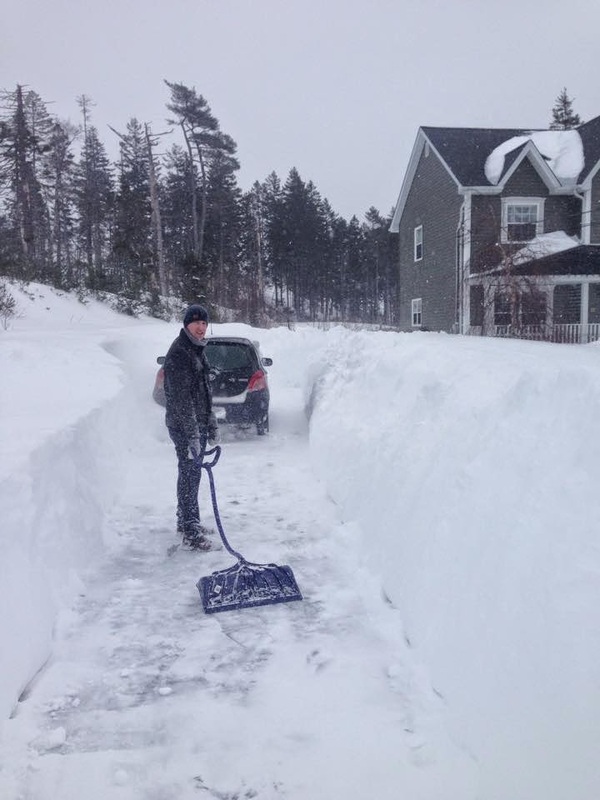 Except, you may not have heard but Atlantic Canada (specifically Nova Scotia and Prince-Edward Island provinces) have been buried under a spell of perpetual winter. Almost Narnia-esque, or Hoth-esque, depending on your preference. 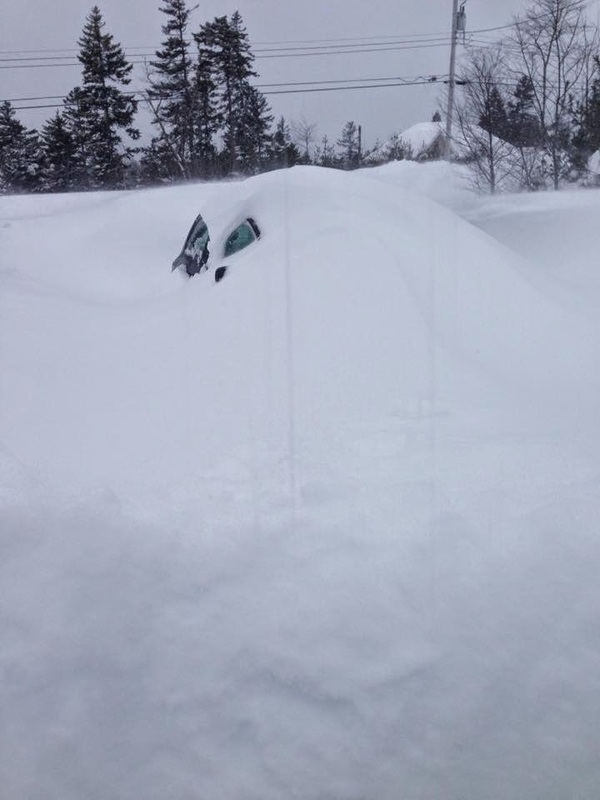 If you wanna see truly crazy pics pre-March storm in PEI- check out this Buzzfeed post (PEI is the little island province near Nova Scotia). 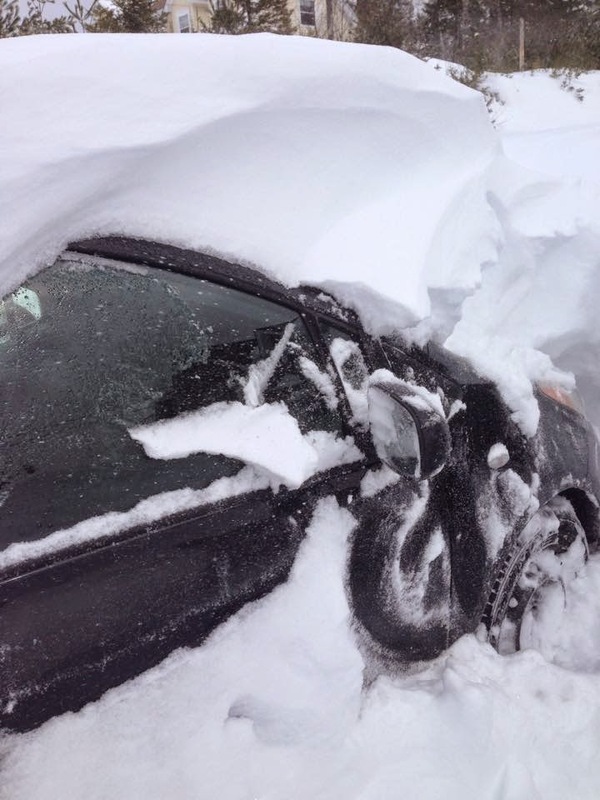 Just last week we got another 5 cm of snow. 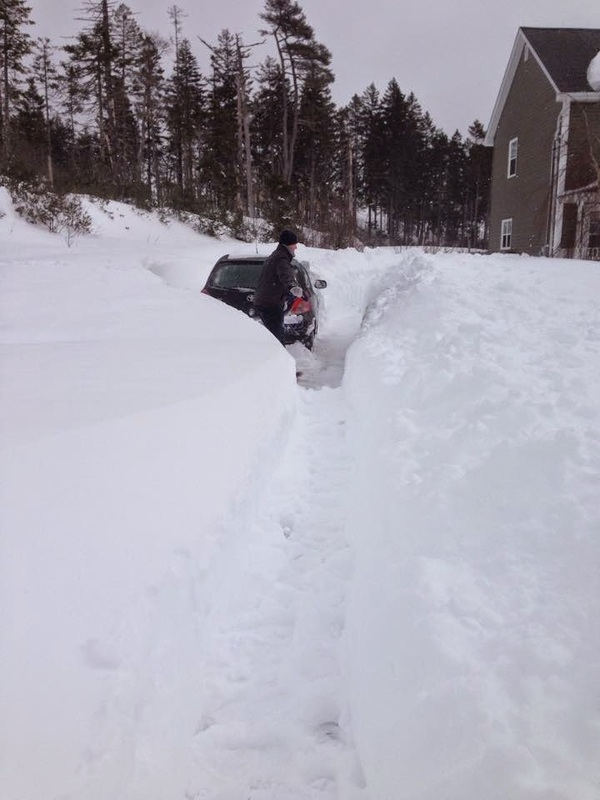 The Snowpocolypse (or end of the world) happened on March 18th this year, where we got between 75-90cm of snow. In one day. 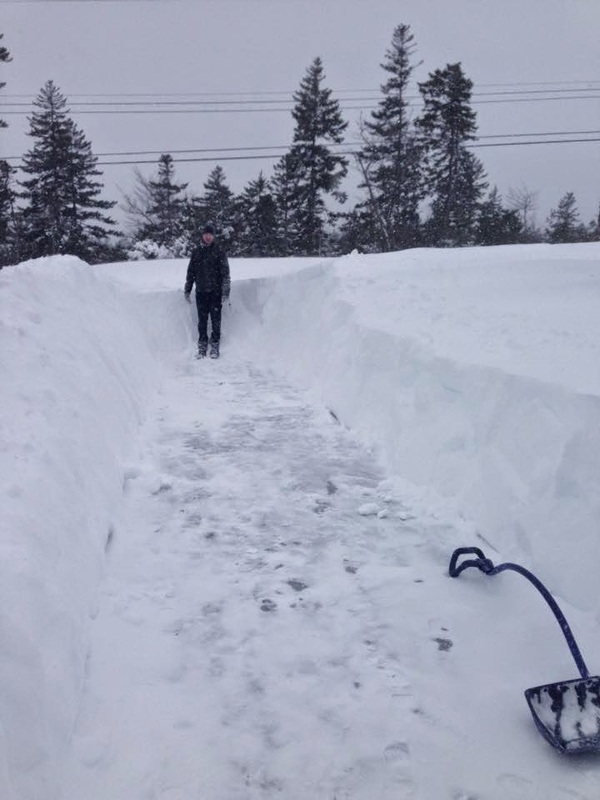 Over the course of February and March the Halifax area got 278 cm. If you can't visualize that, let me help you. Currently, almost a month after Snowmaggedon, our entire yard is still completely covered under 3-4 feet of snow. 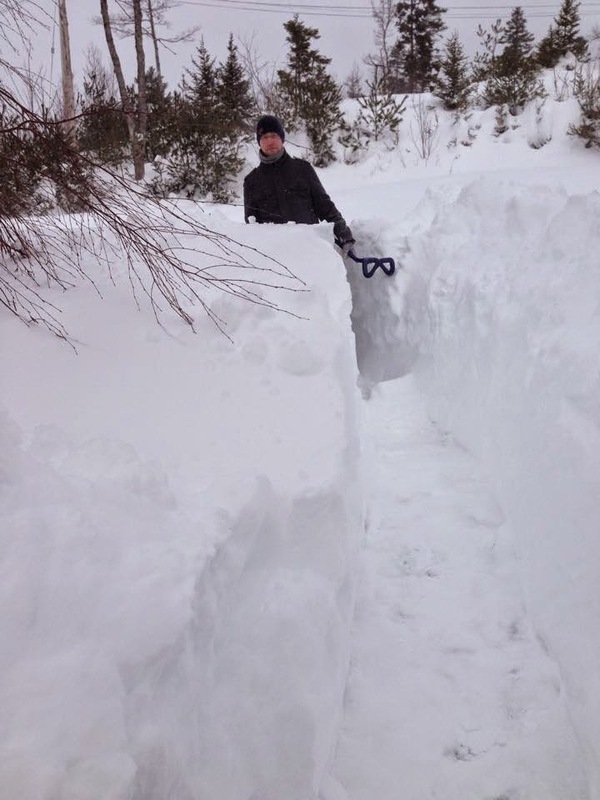 At least the snow banks lining our (hand shovelled) driveway now only come up to my hips instead of my head. Migrating birds who come for worms and bugs (such as Robins and Woodcocks) are starving. Andrew and I bought raspberries for our little Robin buddies. All spring-like activities are a future dream. I am insanely jealous of all the other Boother's pics of dry, spring-esque photos. Why do I live in Atlantic Canada? 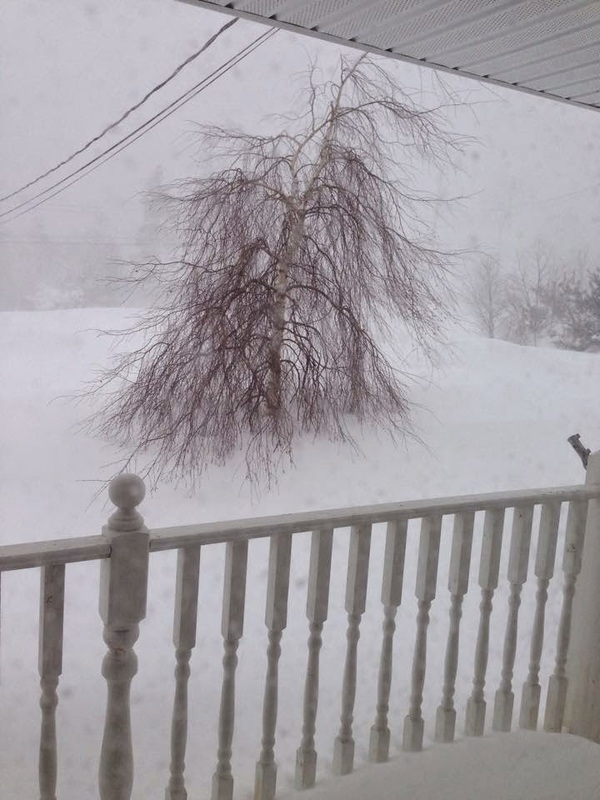 (Oh right, it doesn't usually snow THIS MUCH). So... my expectations for our first ever vegetable garden are this: we will grow something edible. Hah, that's it. I think that's reasonable, eh? 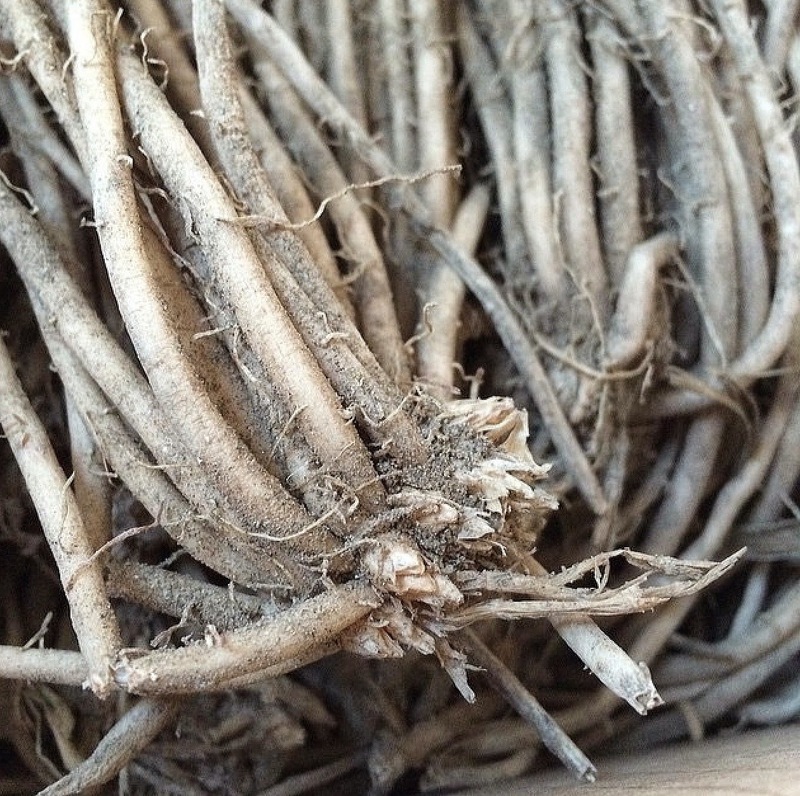 The Climate Crusader is getting her 2015 garden off the ground. I admit it: I am a bit of a haphazard gardener. I grow things, and I try to make sure that my plants are happy, but I rarely prune and I don't spend nearly as much time weeding as I should. In spite of my lax attitude, I still become very upset when I lose plants to pests. It's very discouraging to nurture wee little green shoots from seed, go through the excitement of new growth, and then discover them all decimated by a bug. If I were a master gardener I would probably do things like monitor soil pH, rotate crops and attract helpful insects. I am not a master gardener. My solution is a little easier. Although I do have a yard and several garden beds, I still opt to grow many things in containers. Since I fill my containers with fresh compost every year, my plants are protected from many of the creepy crawlies that can cause problems. In past years I've grown peppers, herbs and flowers in containers. This year I'm growing potatoes, peas and salad greens. 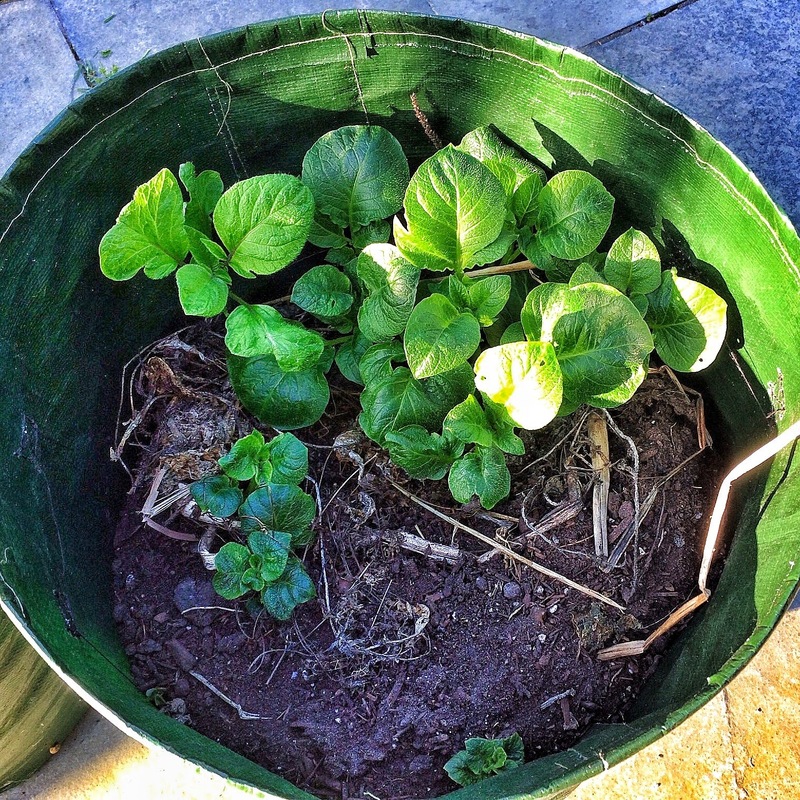 I shared my patio potato planters on this site a couple of years ago. 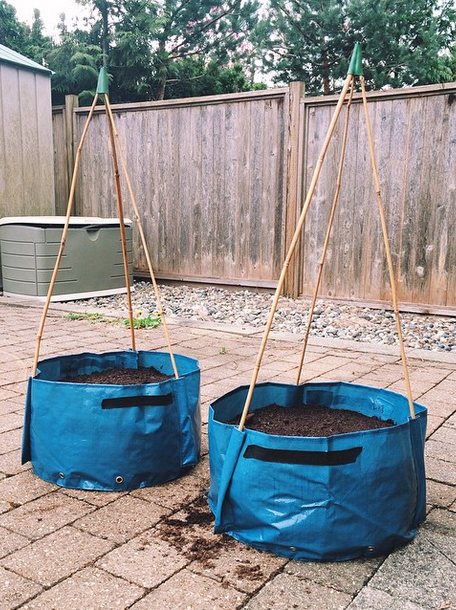 While I bought some commercial potato growing bags, you can also easily create DIY planters. 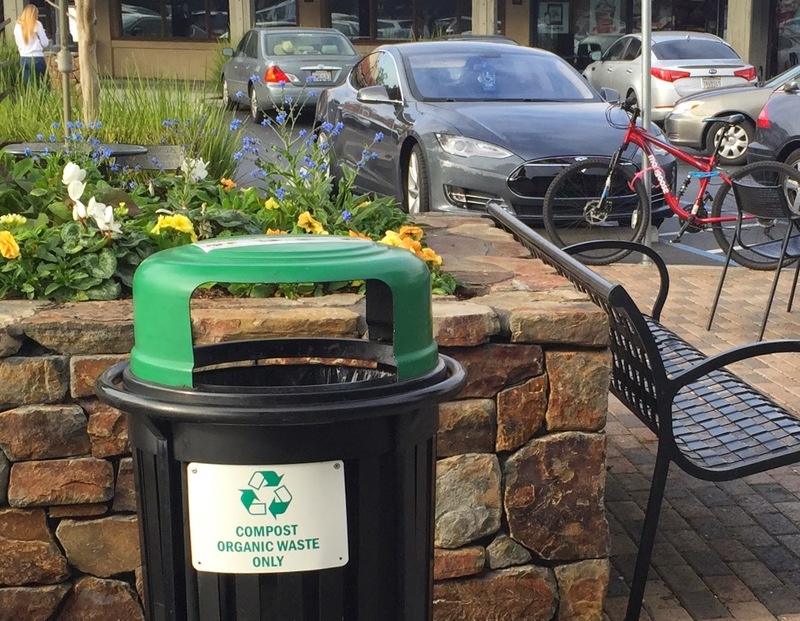 I've seen people use garbage cans, garbage bags, wooden planters and burlap sacks. What I really like about this method is how easy the potato harvest is: just pour out the bag and pick out the potatoes. I typically add the soil from the potato crop to my raised beds. This year I purchased some new bag-style patio planters that have built-in pockets where you can add canes for growing plants that need support, like beans, tomatoes and peas. For my first outing I'm growing peas in my planters. The reason is less to do with pests and more to do with practicality. I have had limited success with trying to build my own pea trellises, and creating a pea teepee in my garden uses a lot of space. Moving them into bags frees up space in my garden beds and simplifies the process. Of all the veggies I've grown, lettuce is the one that has suffered the most at the hands of pests. I live in the Pacific Northwest where the climate is very damp, and we have a lot of woodlice. These bugs are actually beneficial when it comes to breaking down compost, but they have a taste for wee little lettuce sprouts. They can bit off tender shoots in one go, decimating an entire crop in one night. Fortunately lettuce does well in most any container, and my wee little greens are safe from bugs. Do you do any container gardening? What are your favorite crops to grow this way? Queen Composter thought the debate on plastic versus paper was over, but now she's not sure. Recently my family and I were on holiday in Maui, Hawaii, and as soon as we went shopping I noticed that everyone was offering us paper bags for our items. Of course I just pulled out the small cloth shopping bags that I keep in every bag I own and used that. 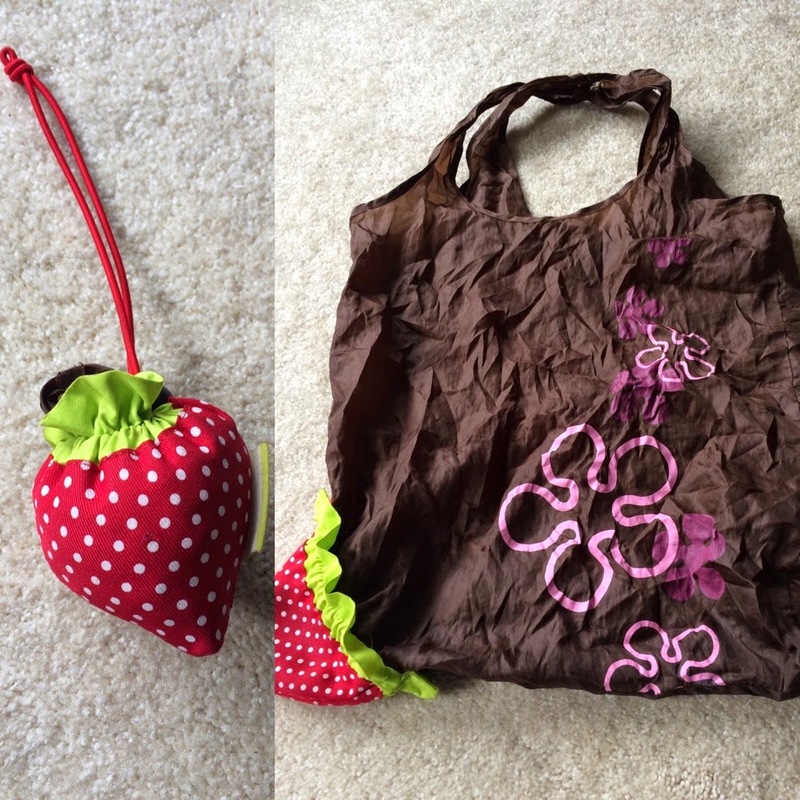 On the few occasions the items didn't fit in my smallish shopping bags, I returned the paper bags and just carried out my purchases in my hand rather than use a large paper bag. After a few days of this I did a quick google search to discover that there is a ban on plastic shopping bags on the island. My initial reaction was yes! But then I remembered that I saw everyone walking out of stores with paper bags, not reusable bags. When I remarked on this, my oldest daughter commented that paper bags are probably better than plastic. It may have been due to being spring break and the area was full of tourists who (unlike me) do not travel with their reusable shopping bags, so their only choice was to use paper bags. However, this is not the full story because we also went shopping in less touristy areas and there was still a predominance of paper bags. This did not sit right with me. After all, as a reasonably environmentally aware person, I knew that the best choice should always be to use reusable shopping bags, rather than having to chose between paper or plastic bags. have one or two on hand when needed, even on vacation. "Biodegradable" plastic bags, made from a mix of plastic and corn, have their own set of issues and are not a panacea for the environment. 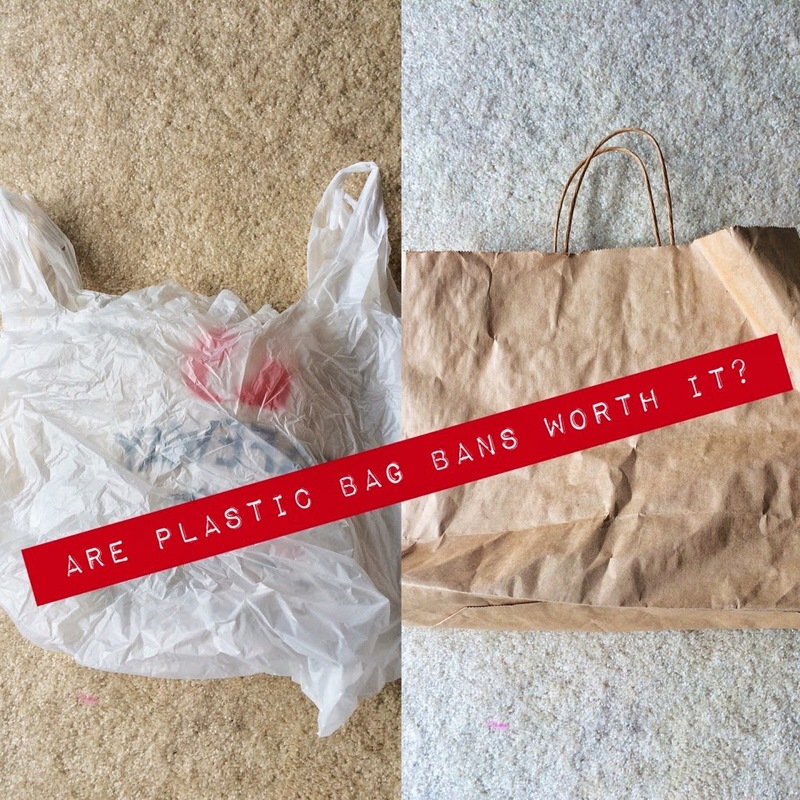 I also found some interesting infographics comparing plastic bag use and reuseable shopping bags (single use, versus multiple use) here. 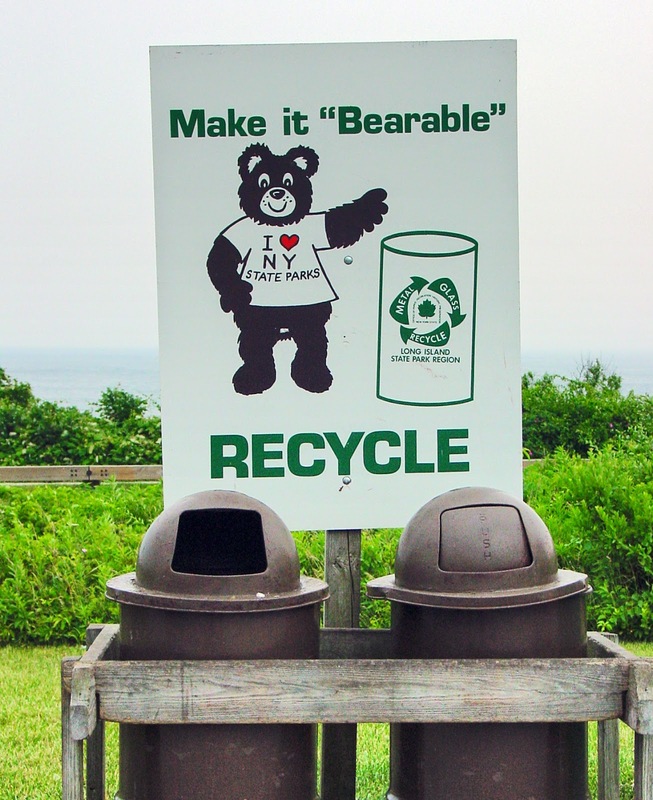 The plastic bag ban started to feel like environmental lip service and greenwashing. People get to pat themselves on the back that they are doing something for the environment, but it is just replacing one problem for another. 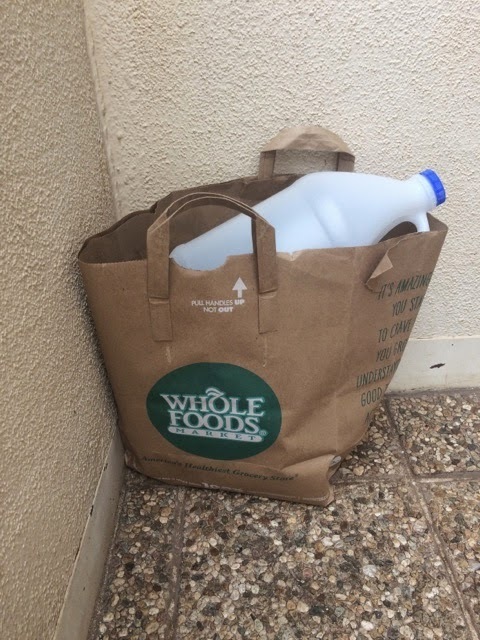 So I ask readers who may live in areas with plastic bag bans: do you feel the ban encourages more people to use reusable shopping bags? Or is paper making a comeback?